R S Raghavan (60), a Science graduate with Chartered Accountancy and CAIIB as professional qualifications, was born in Chennai and had his schooling in P S High School, Mylapore and graduated in Science from A M Jain collage, Meenambakkam, Chennai. Taking it as a personal challenge, he switched over his discipline to commerce and became the first in the large family to become Chartered Accountant. 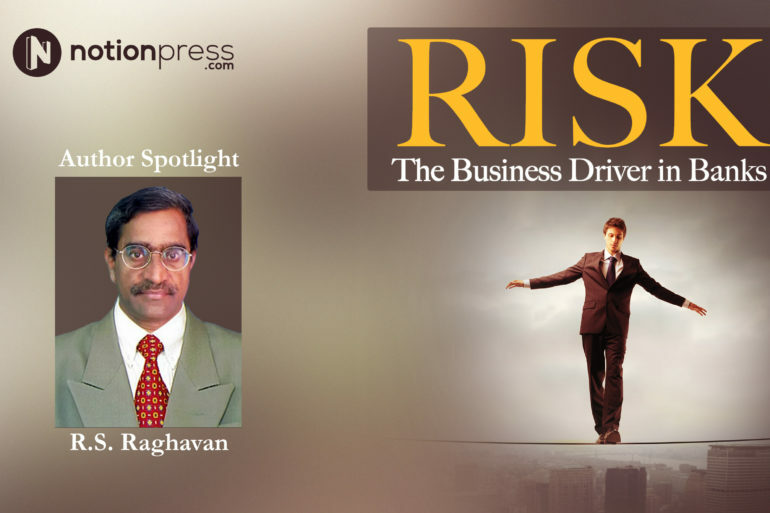 He has travelled extensively across the country handling Credit Appraisal and Credit Management, primarily in Mumbai, the commercial Capital of India, before setting up a full-fledged Risk Management Department in the Bank in the early part of the century and served in the Risk Management Department for more than eight years. He has exposure in Branch Inspection & Branch operations. He, while serving as a Branch Head in Delhi, took Voluntarily Retirement as Asst. General Manager. RISK, The Business Driver in Banks spans across both the Assets and Liabilities of Banking institution, as products of both the sides of Balance Sheet of banks are being marketed and both are fraught with some sort of risk. Essence of Banking is risk taking. Thus all angles of Risk Management in Banks, covered in the Book assume greater importance. It is a reference book with lexicon of Risk, not too technical, but embracing all the relevant aspects of Risk Management. It is comprehensive and quite unique as it covers Banking evolution, Risk Management, Risk Based Supervision, Risk Based Performance Measurement, Internal Capital Adequacy Assessment Process (ICAAP), Basel Norms, etc., in easily understandable language. Who are your large audience and how do you feel this book is going to make a change in their lives? As the Book is about risk in Banking activities, the targeted audiences are Bankers juniors, middle level and senior employees, Auditors, Finance professionals and Students of Commerce, Finance and Management. How long have you been working on this manuscript? It took six month time after the March 14, financials of Banks were announced. The fact that I have been contributing banking related articles regularly to professional Journals like Chartered Accountant, Indian Banker, Accounting World of ICFAI, etc., helped me to go through the process of authoring a book. Strangely, few of my published articles in professional journals were copied by a few others, without my knowledge and also the organization. That was the time I thought why don’t we our-self graduate to writing or authoring a book. My Bed rest due to some sort of sickness helped me to think of coming out with a book. How did you make up your mind for self-publishing? Self-Publishing a book reduces dependency on other non-core but related aspects and provides adequate freedom of management. Experience is excellent from a very professional set up of personnel who knows the business in which they are in. The responses are quick and packages suiting to variety of authors. Automated and interactive website is very author friendly. What do you think has been the advantages of working with Notion Press? Reach is very wide and Notion Press has multi-various related activities like Story contest through Litagram. Notion Press encourages authors who after experience of one publication come back to them after the maiden attempt. Reach of the book is mainly through e-mail contacts and personal inter action of the Author with the Banking professionals. Once reviews are published and the Marketing Division of Notion Press pushes, the reach would be enlarged to greater heights. Writing should be an interruption to reading. The more one reads, the capability to write enhances. Contributing articles to journals and magazines and responding to common issues through the Letters to the Editor column of newspapers, would facilitate to graduate to author a Book. An author should be an authoritative in the chosen subject as well as the language.